1/2″ (13mm) ID x 25' (7.6 m) long thermoplastic waterblast hose. 1/2″NPT ends. Working pressure up to 10,000 psi (690 bar). 1/2″ (13mm) ID x 25' (7.6 m) long thermoplastic waterblast hose. 1/2″NPT ends. Working pressure up to 15,000 psi (1040 bar). 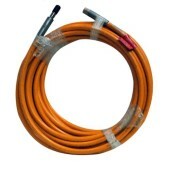 1/4″ (6mm) ID x 35' (10.7 m) long thermoplastic waterblast hose. 9/16″ Type M ends. Working pressure up to 40,600 psi (2800 bar). Reinforced clear PVC abrasion cover. 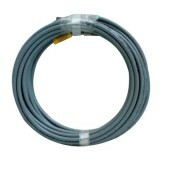 3/16″ (5mm) ID x 35' (10.7 m) long thermoplastic flex lance. 9/16″ HP Tube LH Male ends. Working pressure up to 46,400 psi (3200 bar). For use in tubes with ID of 1 in. (25 mm) or greater. 3/16″ (5mm) ID x 50' (15.2 m) long thermoplastic flex lance. 9/16″ HP Tube LH Male ends. Working pressure up to 46,400 psi (3200 bar). For use in tubes with ID of 1 in. (25 mm) or greater. 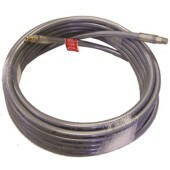 5/16″ (8mm) ID x 25' (7.6 m) long thermoplastic flex lance. 9/16″ JS Lance Female ends. Working pressure up to 21,750 psi (1500 bar). For use in tubes with ID of 15/16 in. (24 mm) or greater. 5/16″ (8mm) ID x 50' (15.2 m) long thermoplastic waterblast hose. 3/4″ Type M ends. Working pressure up to 21,750 psi (1500 bar). Reinforced clear PVC abrasion cover. 1/2″ (13mm) ID x 35' (10.7 m) long thermoplastic waterblast hose. 1/2″NPT ends. Working pressure up to 10,000 psi (690 bar). 1/2″ (13mm) ID x 50' (15.2 m) long thermoplastic waterblast hose. 1/2″NPT ends. Working pressure up to 10,000 psi (690 bar). 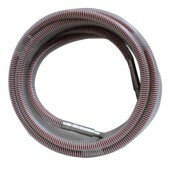 1/2″ (13mm) ID x 66' (20.1 m) long thermoplastic waterblast hose. 1/2″NPT ends. Working pressure up to 10,000 psi (690 bar). 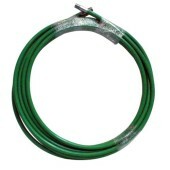 1/2″ (13mm) ID x 35' (10.7 m) long thermoplastic waterblast hose. 1/2″NPT ends. Working pressure up to 15,000 psi (1040 bar). 1/2″ (13mm) ID x 50' (15.2 m) long thermoplastic waterblast hose. 1/2″NPT ends. Working pressure up to 15,000 psi (1040 bar).